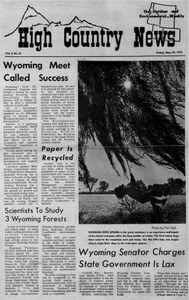 Wyoming's First Environmental Congress was termed a success by many leading Wyoming conservationists. Senator Gale McGee, D-Wyo., cited Wyoming's failure to use its share of federal water pollution assistance as an example of "ostrich-like do nothingism," which he stated endangers the state's future. A team of forest scientists was recently named to study timber-cutting practices and related resource management activities in high altitude areas in northwestern Wyoming national forests.